Welcome to the website of the Commission des services juridiques, the agency charged with administering Québec’s legal aid system. The legal aid system was established in 1973 and is recognized as being original, creative and unique. More than 40 years later, a number of other legislatures have drawn inspiration from Québec’s model when establishing or updating their legal aid system. Over the years, Québec’s legal aid network has had a considerable impact on access to justice and has played a significant role in the dissemination of legal information to the public. 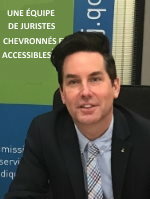 Whether through its participation in the legislative process or through the more than nine million instances in which it has provided services to litigants in Québec, our legal aid system has shown itself to be not only an essential service for eligible litigants, but also an indispensable component of the government’s policy to improve access to justice. The January 1, 2014 increase in eligibility thresholds for free legal aid and the increase of January 1, 2016, which are based on the minimum wage and are maintained at that level through an indexation clause, form part of the measures intended to offer citizens better access to the justice system. In addition to learning more about Québec’s legal aid system and obtaining legal information, by visiting our website you can find out the eligibility criteria for free legal aid services and for services requiring a contribution. Did you know that even if you are not eligible for free legal aid you may be able to obtain legal services in return for a maximum fee ranging from $100 to $800, depending on your situation? To find out more, please visit our webpage on Services requiring a contribution . You can also contact staff at the Legal Aid office nearest you in order to determine your eligibility. In addition, for the first time since the creation of the legal aid system, a new legal aid service in family law matters is available to everyone, regardless of the recipient’s financial situation. Since October 10, 2013, citizens can contact a legal aid office to take advantage of the Homologation Assistance Service (HAS) in order to obtain the modification of a judgment or the recalculation of support payments initially established by a court. More information on this service is available under the “Homologation” tab. Moreover, since April 1, 2014, the CSJ has been responsible for managing another service, the Service administratif de rajustement des pensions alimentaires pour enfants (SARPA). Under certain conditions, this purely administrative service, which is also offered to everyone regardless of income, allows parents to have child support payments recalculated without having to use a lawyer or go to court. More information about this service is available at www.sarpaquebec.ca. Until next time, enjoy your visit!